Here's hoping that 2014 was everything that it promised to be a year ago. 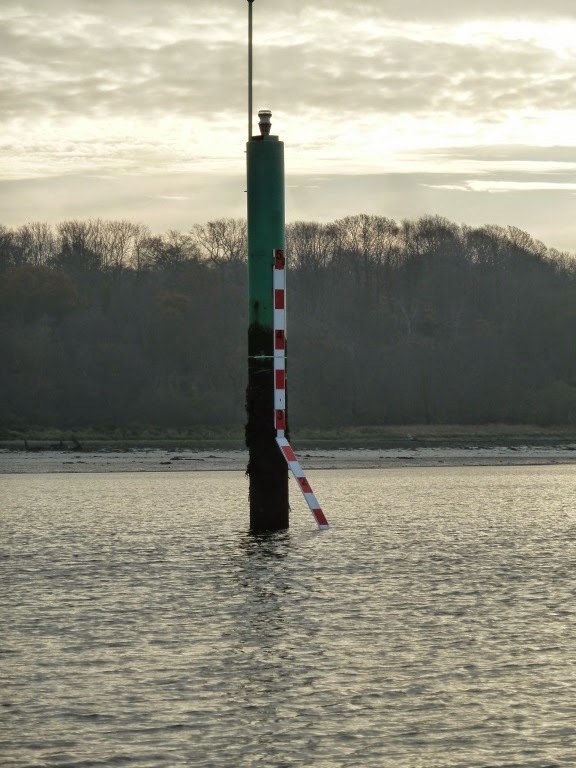 Low water, on a late autumn morning the view from a small rowing boat gives an interesting perspective on some of the barges on the river. 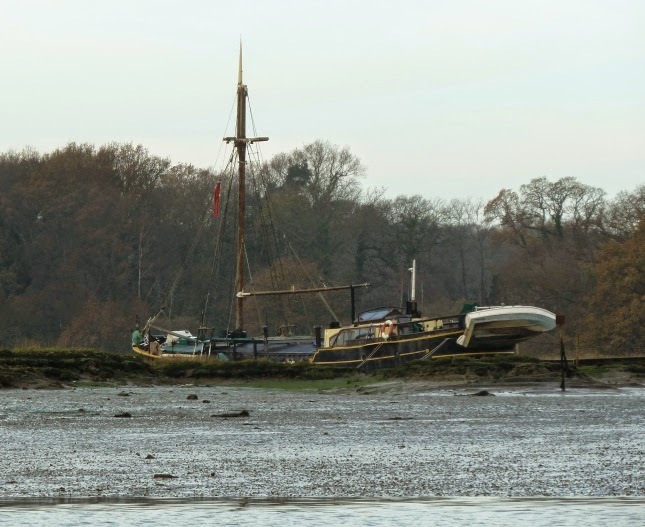 Unlike the east coast the Solent is not renowned for mud, but there was enough to leave these barge/houseboats high and dry in Saltern's creek. 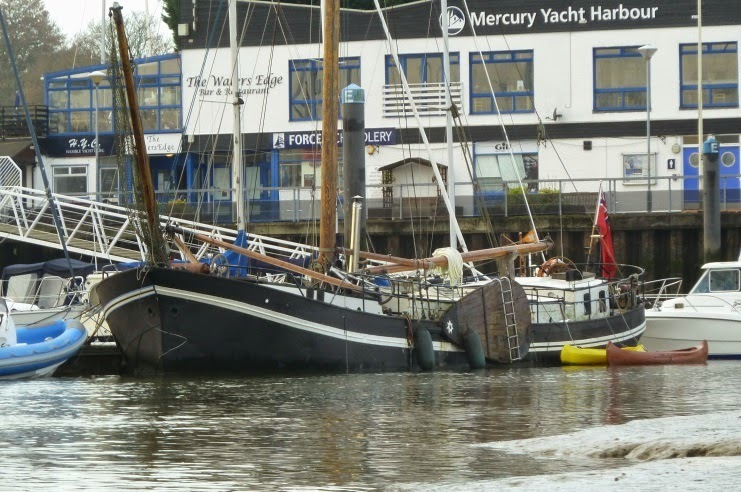 Slightly down stream at Mercury this one was afloat a;ongside the pontoon, even with the bowsprit pulled up I hate to think what the mooring charges are. 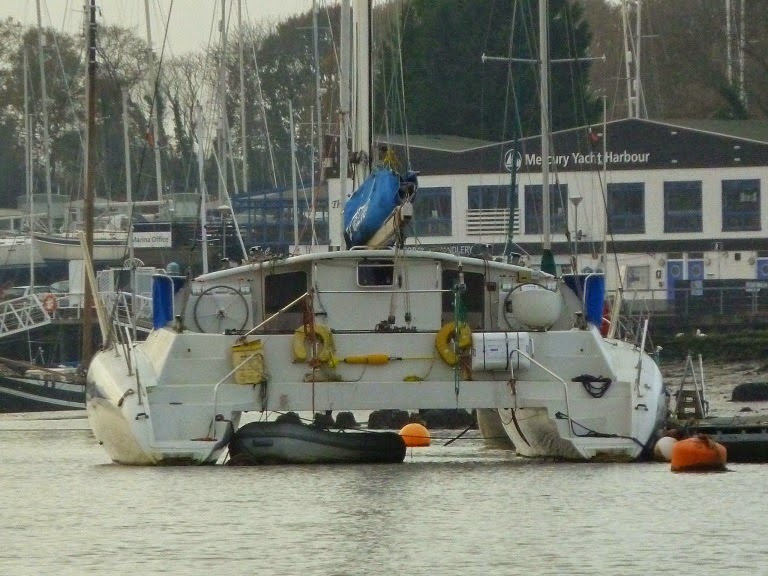 One of the other nearby marina's have just cleared the last three houseboats from the pontoon, Currently the spaces are empty but I wonder if some redevelopment is planned. 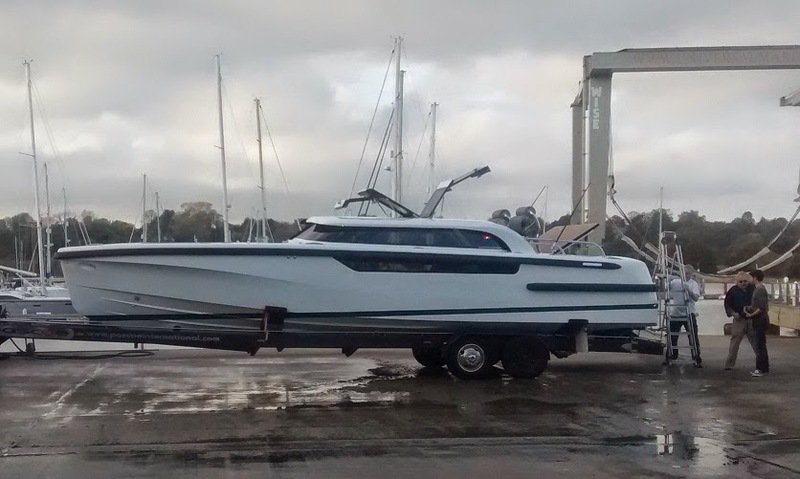 Matilda Emile our First 21 was sold and traveled by trailer to her new base in Scarborough during November. 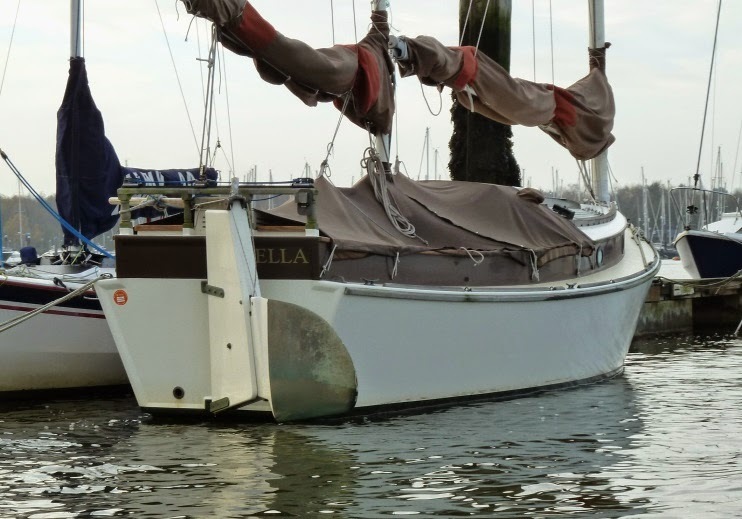 She's been a great little boat and I'm sure the new owner will have lots of fun sailing her. If you're up that way the owner is a member of the Scarborough YC and plans to race her in the the club's North Sea race. Now renamed Valkyre before she went back in the water she had a good polish and some paint, I especially like the gold cove stripe and the Christmas tree. Of course this leaves us with the dilemma of what next? 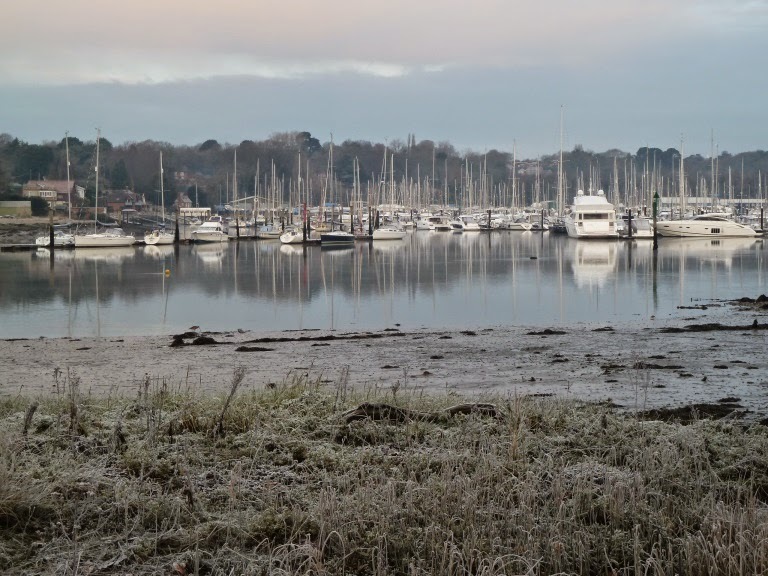 Quite apart from having no idea, I did quick tot up of the remaining Bursledon fleet and got to 10 (including the herb boat) and not forgetting that Joseph will most likely be needing an Opi soon. 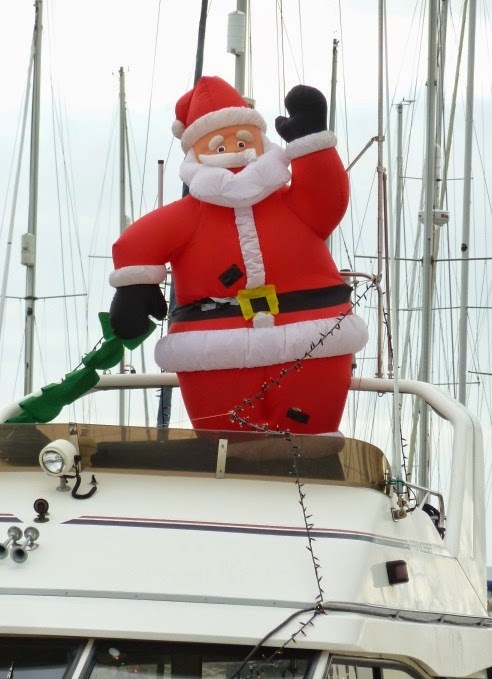 Must have been difficult landing his reindeer on that, maybe that's why it's called a flying bridge. Actually this looks more like a left over from Halloween.. 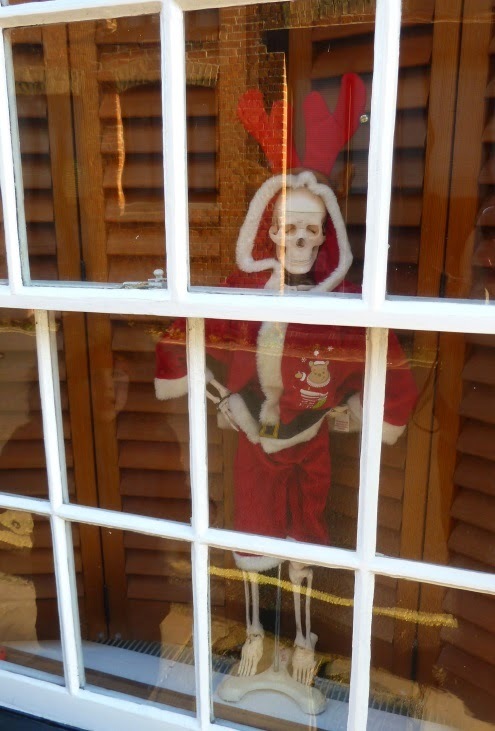 It's got to be one of the strangest Christmas decoration ever. 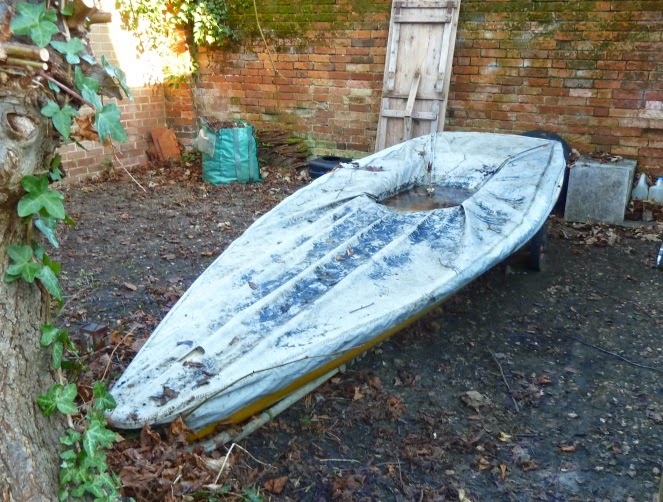 I confess to not really being in tune with modern yacht and motorboat design, but I know enough to think that this is maybe probably cutting edge in fast launch styling. 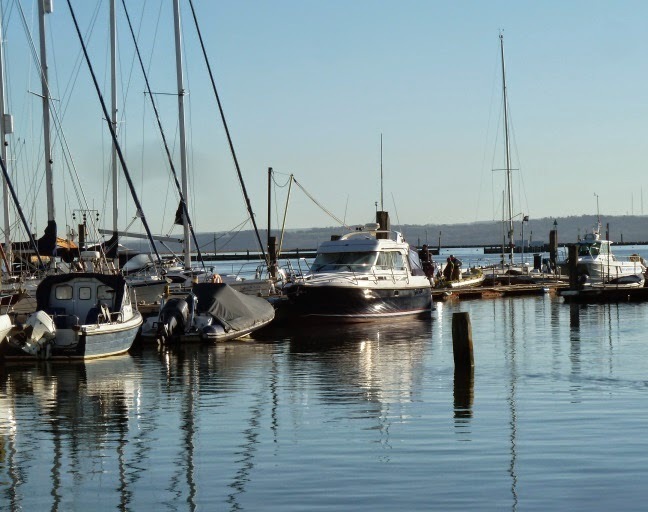 I was out for a lunch time run passing through the local marina and spotted a photo session of this fast motor boat, maybe a modern interpretation of what was called a commuter boat in the US. The hull form is interesting with those fine bows flowing back to a hard chine which should provide stability. As for the styling, well it's certainly contemporary in the Range Rover Evoque, Star Wars storm trooper look. Hang on a minute didn't Star wars some out in 1977 when people still thought flared trousers were cool? And don't those gull wing doors look strangely familiar? It all seems a far cry from the Bauhaus mantra "form follows function" but I have to say I quite like it's post modernist, dynamic metaphor. I hope the photographer managed to get some better shots than me and that you enjoyed this bit of ironic banter. 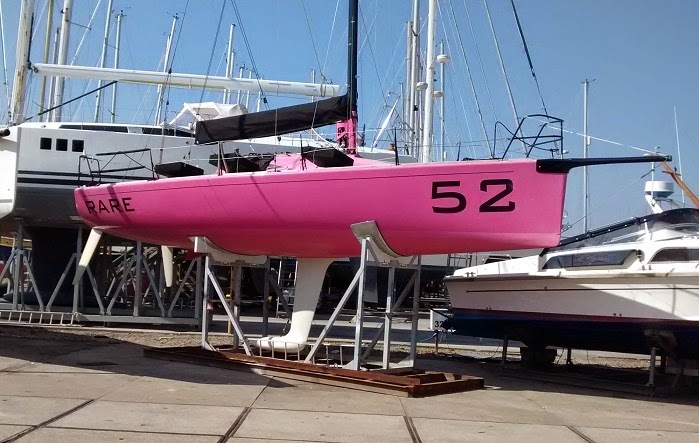 What can I say I like pink boats, especially this one. Maybe I'm getting in touch with my feminine side? 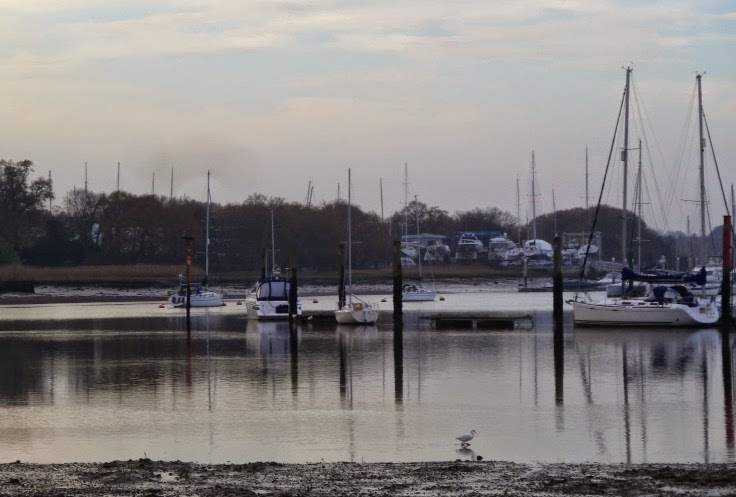 Just down the river one of our local marinas had a great little coffee shop, it was a take away but there were seats outside and it was a perfect stopping off spot for walkers taking the river path between Warsash and Swanwick. 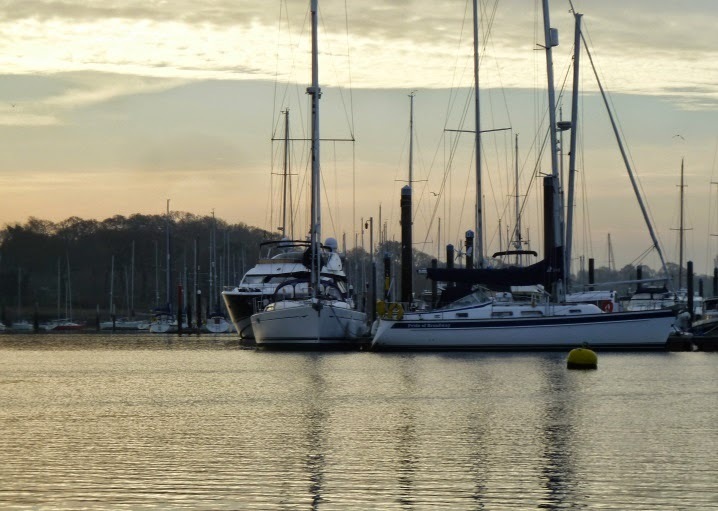 Back at the start of the season it closed and a new upmarket restaurant opened, and by all accounts it's very good, but not really the sort of place you'd go to for a tea break while anti fouling the boat or out for a stroll with muddy shoes. 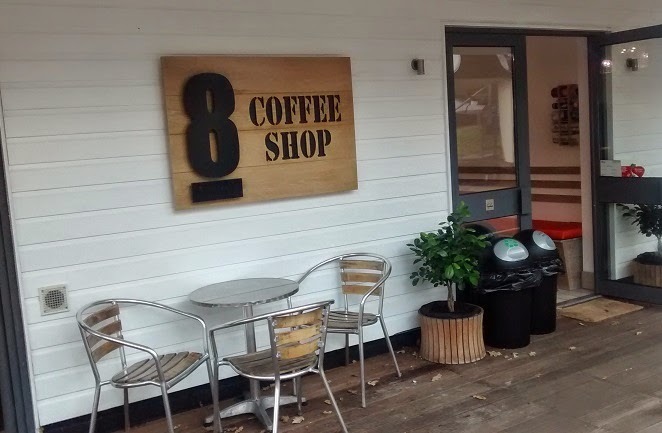 Fortunately the operators have figured that they are serving two different markets and the Coffee 8 shop is back open for snacks and drinks. No this isn't about the latest record attempt, the laser in question most probably sailed in some exotic locations when it traveled around the world aboard HMS Illustrious. It's certainly well traveled and even if it wasn't under it's own sails most of the time it's a boat with a unique history. Looking a bit sad and neglected it's up for sale, I have the phone number of the seller if anyone's interested. We took Joseph up to London to see a few of the Christmas sights and lights. 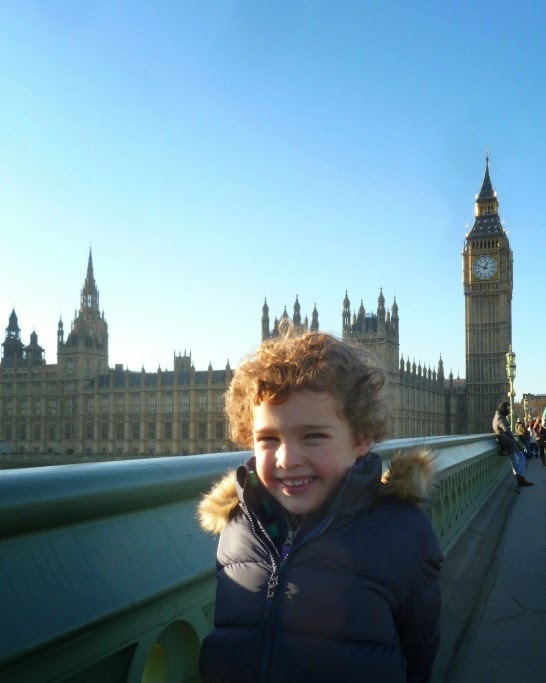 Joseph was very determined to see Big Ben and the House of Parliament, back in November at school they'd been learning about Guy Fawkes and the gunpowder plot, the sort of history subject that fascinates five year olds. The organised queue outside Westminster Abbey was just too much so we went into the adjacent and delightful St Margaret's Church where and there was an organ recital. I reluctantly complied with the no photography signs, but if you visit, the stained glass windows on the east side depict the funeral of Admiral Robert Blake 1657 with the most detailed and exquisite depiction of the Thames and Westminster Abbey. 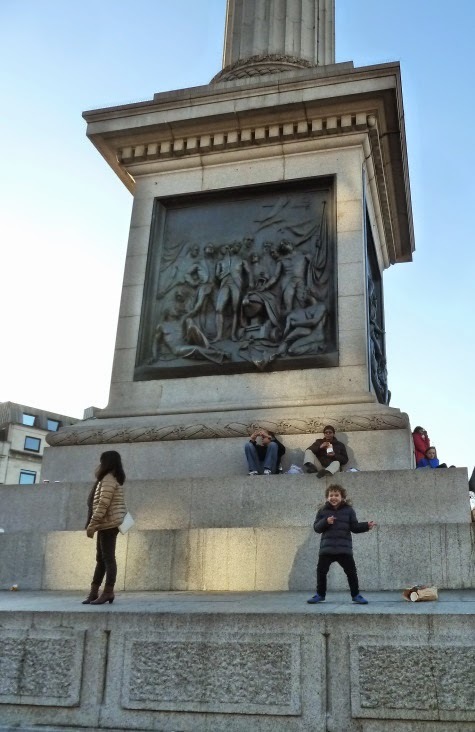 A little later in Trafalgar Square, Joseph was showing no interest in the giant blue chicken, rather he was treating our most famous monument as a playground along with the other kids. 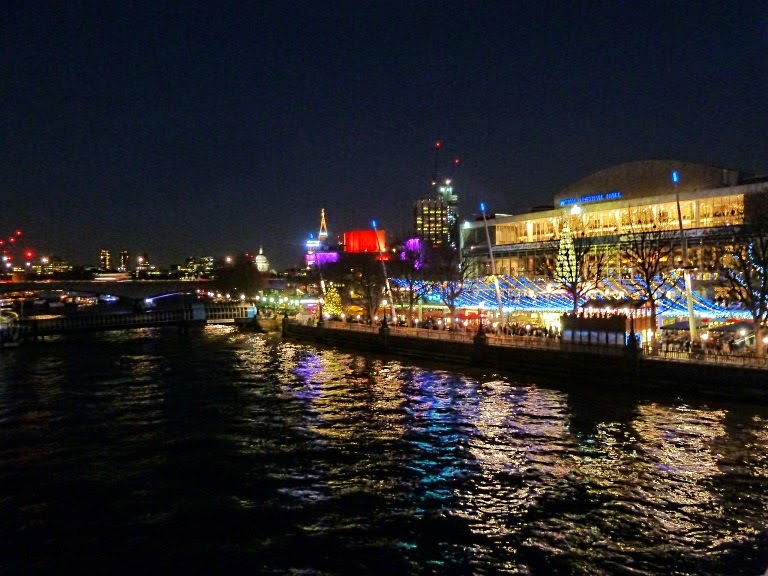 The winter market in the South bank was great and Joseph watched fascinated as a street performer lay on a bed of nails in Covent Garden. As it stared to get dark we walked up through Leicester Square and Piccadilly Circus to see the lights in Regent Street. It was very, very crowded and the lights were really underwhelming. The most disappointing visit was Hamley's the world famous toy shop which was manically crowded, run down and had five floors of mostly tat, I know it's been about 50 years since I went there as a child but I remember it being very different, even Joseph wasn't that interested. By the time it got light and I dragged myself out of the house it was after 8.00 AM so not an especially early morning run, but with clear skies all night the ground was covered in a white frost. Light rain was predicted and sure enough as I write this back at home with my morning coffee it's just started a light drizzle which is washing the frost away. The past few weeks at work have been crazy, 16 hour days and even two all night'ers, so the opportunity to get out, slow down and feel in touch with the surroundings is wonderful, I think in Zen it's called mindfulness, taking time to experience and appreciate all the things around you, family , our home, the changing river, winter wildlife, the pale lemon yellow winter sun starting to show through the trees, the hot warming coffee after the exertion of the run: a continuous, clear awareness of the present moment. Did we get weather bombed? It was windy through Thursday night and Friday morning, rain was lashing the windows and rattling the slates on the roof, even though we're tucked in the lee of a hill and a row of majestic chestnut trees for protection. 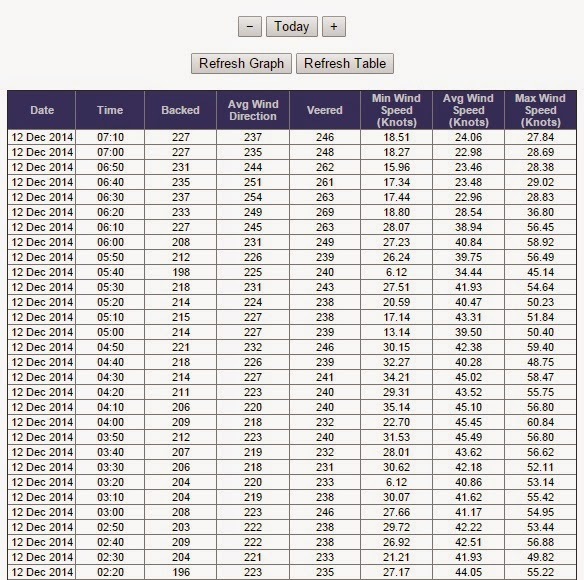 Gusts were consistently 50knots and above, it was definitely a nigh for staying in and the last place I'd want to be is out at sea. 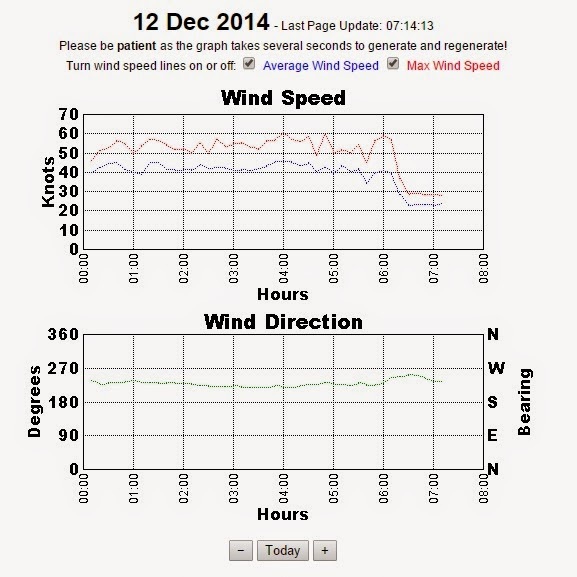 But weather bomb? Where did that phrase come from? More like the sort of winter weather you expect on the coast when a big winter depression comes through. The heritage museum which is the old Bursledon brick works site had a pre Christmas winter open day, the weather was fine and surprisingly warm hitting 12 degrees in the midday sunshine. It's been 2 years since we visited and the program of open day events has clearly become popular judging by the visitor numbers. 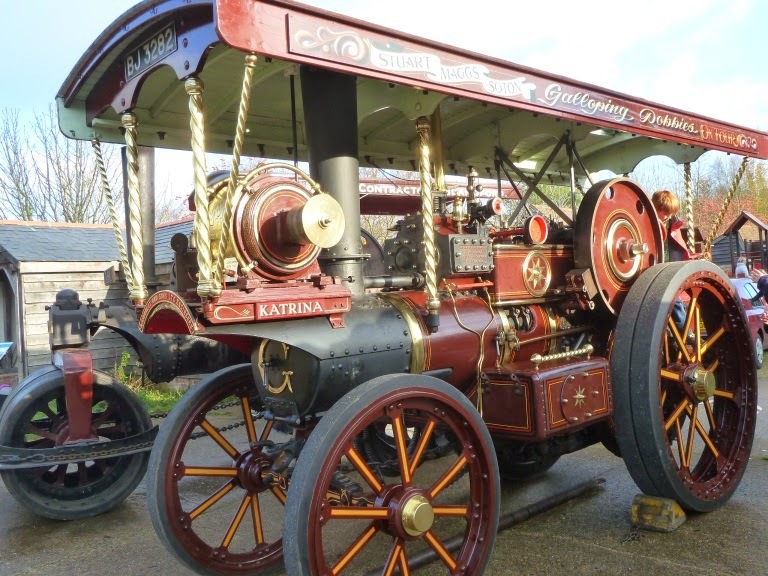 There was a good turn out of steam engines, stream rollers and traction engines including the lovely Katrina above. 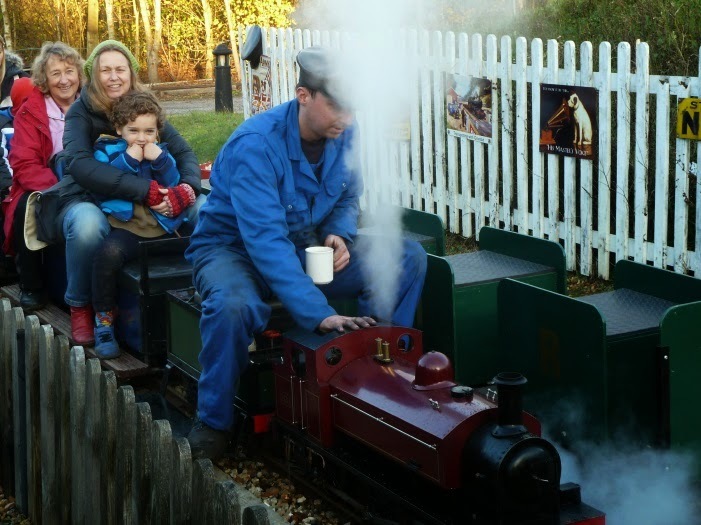 The Hampshire Narrow Gauge trust were running Wendy their full size narrow gauge steam engine on the "main line" and hauling packed trips on the miniature 7.5" gauge with live steam. 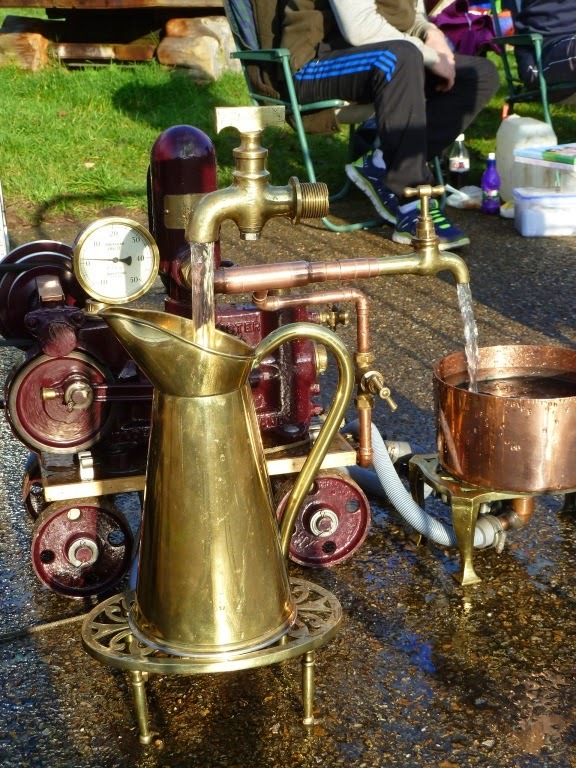 There was a selection of immaculately restored stationary engines, including this one running the "magic tap". 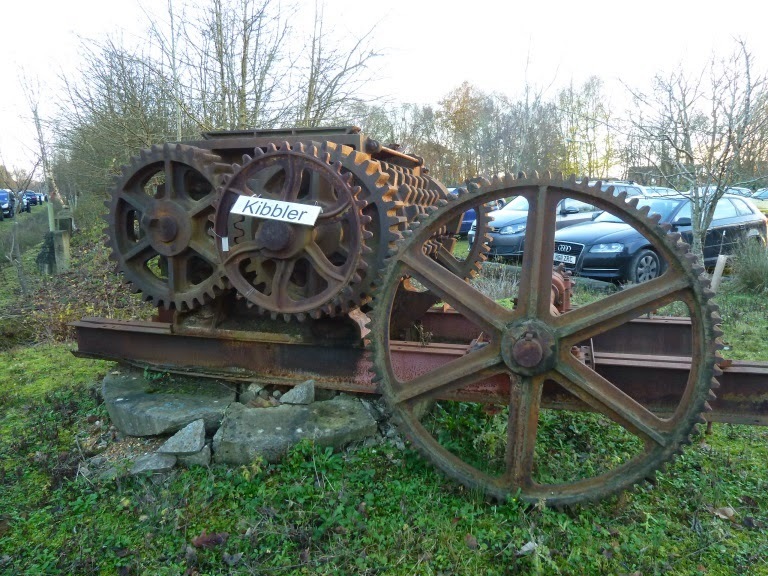 The museum is very much work in progress, recording the local industrial archaeology, there's lots of interesting rescued equipment waiting to be restored. One of my favorites is the Kibbler, there was no explanation as to it's purpose, but it's clearly powerful and what a great name. 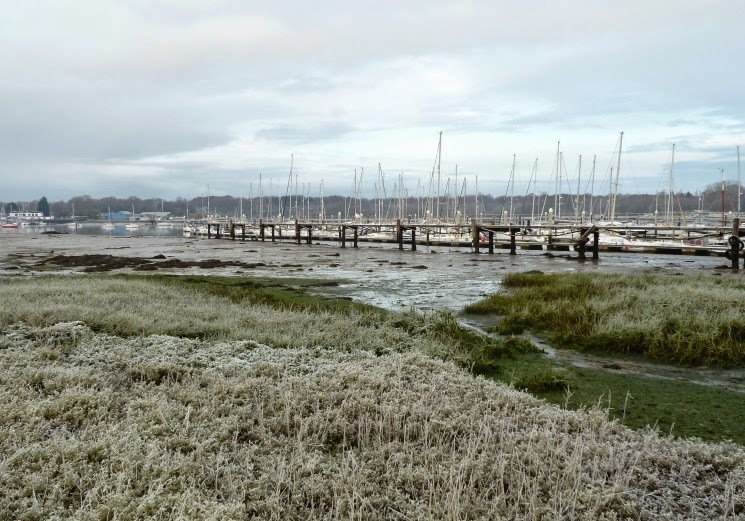 could go out in all weathers gathering oysters and then run breaking bars to get the catches to market as early as possible. 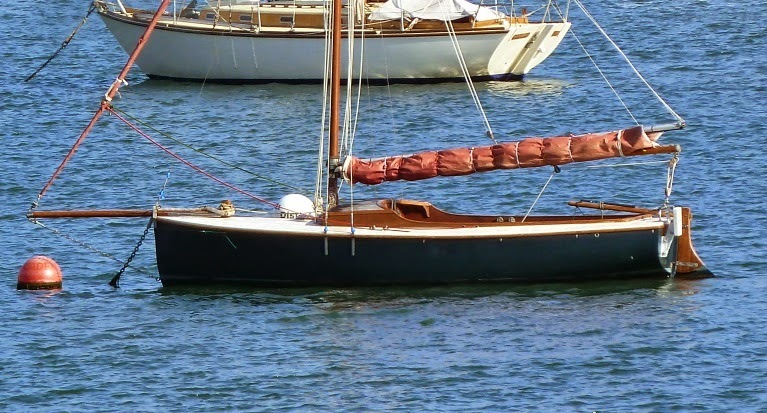 The boats were all more or less flat bottomed, vee sided and unstayed cat ketch rigged. The modern epoxy ply boats are lightly built and some are fitted with carbon fiber masts.while the type evolved for speed in shallow water there have been some remarkable deep water voyages most famously Robert Ayliffe's crossing of the Bass Straight in his NIS 23 Charlie Fisher. 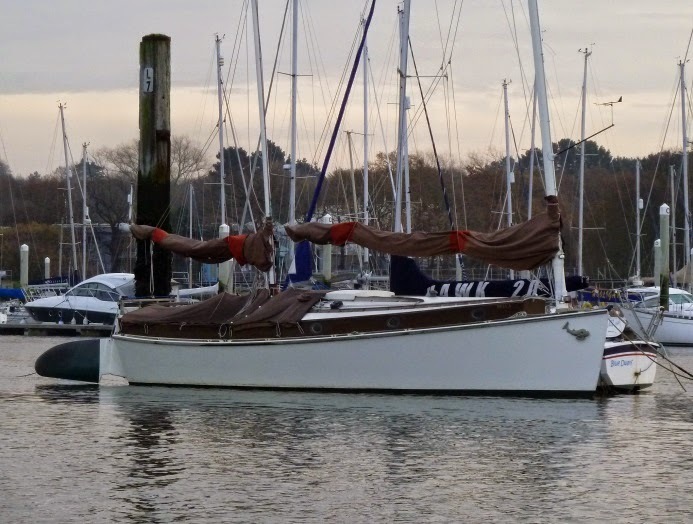 Fast, easy to handle and shoal draft, sounds like a great cruising boat for the waters of the Solent especially if you want to get away from the crowds with their deep keels. Norwalk Island Sharies are few and far between in the UK, but Bella has been on the river for a two or three years. 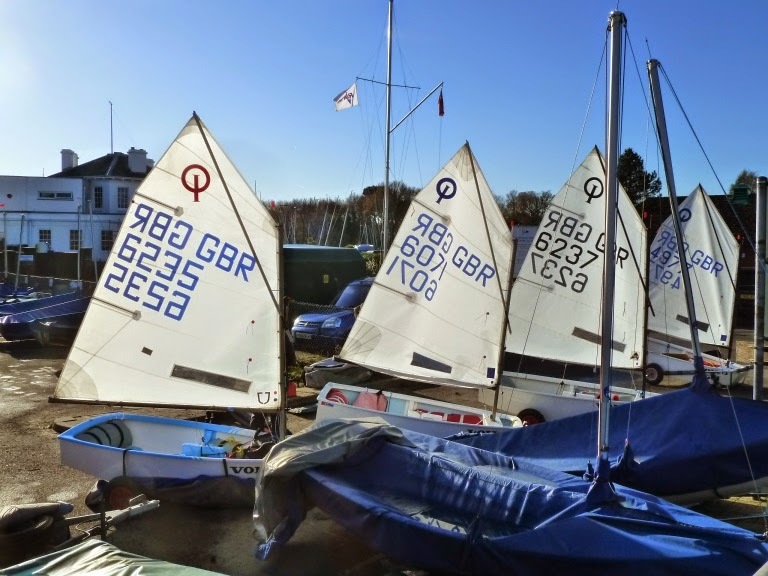 If the owners are readers I'd love the opportunity to see how one sails, if you need a crew one afternoon drop me an email. 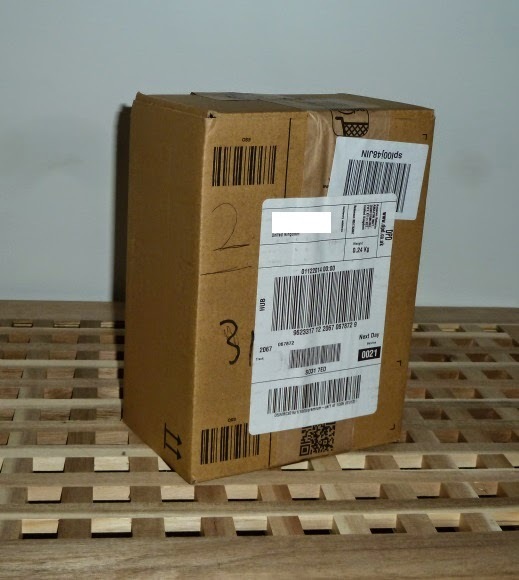 A box arrived by carrier, it's dimensions 9" tall, 7" wide and 4" deep, neither of us could think what we had ordered online that would fit those dimensions, what could it be? Can you guess or maybe you have already received one? The cold snap brought with it clear skies, morning frost and a beautiful Saturday morning. 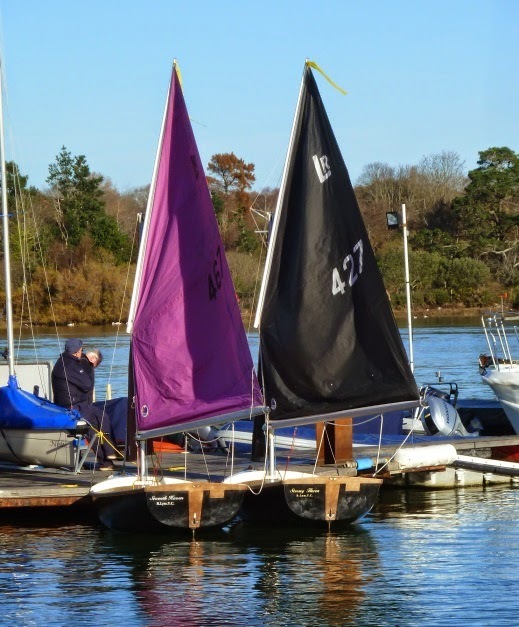 There was even a pair of SCOWs rigged and ready to sail over at the Royal Lymington YC, great sail colours. Keeping the inflatable covered to avoid damage to the fabric from ultraviolet rays is probably a good idea in the harsh Caribbean sun, not sure that keeping it afloat all the time is all that good idea though, I might be tempted to keep it on deck, there's certainly enough space. 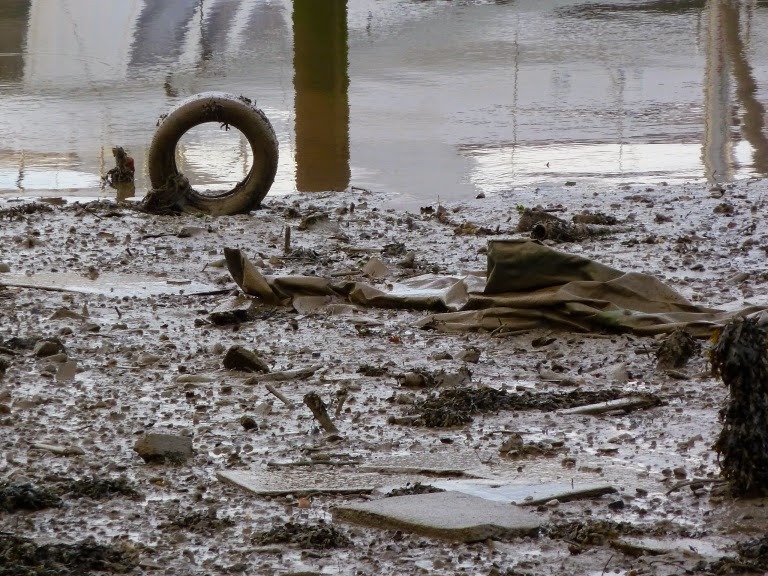 It wasn't an especially low tide, but it was enough to uncover the huge amount of debris and rubbish that's ended up in the river - shocking. 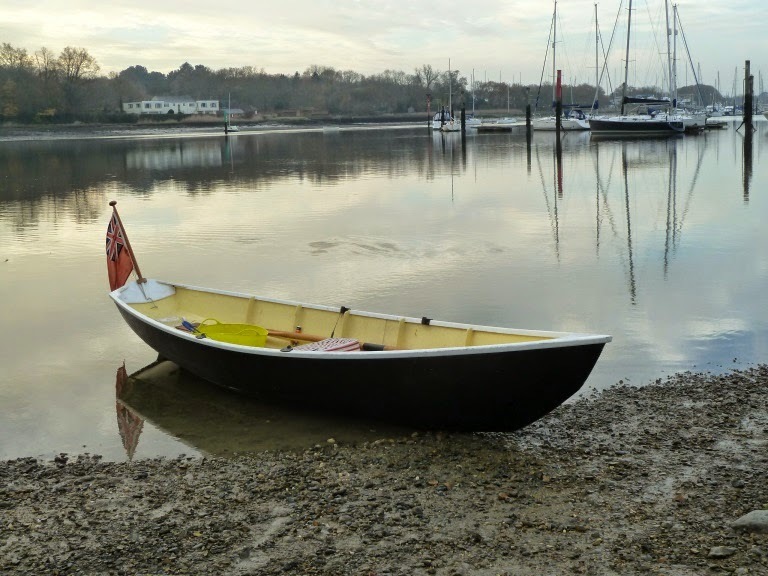 As Tillerman pointed out my post last weeeknd about the weather was a little depressing, so for the first time in a few weeks Saturday morning dawned well if not bright but at least fine and dry I grabbed the opportunity to go for an early morning row. The water was like a mirror with just the lightest breath of wind starting to ripple the water out in the middle of the river. Gradually the sun started to rise over the trees on the eastern shore lending a yellow light to the scene. It's been a long few weeks at work but rowing a few miles in the early morning blew away the cobwebs, I pulled the boat back up the hill feeling fit and hungry ready for breakfast. 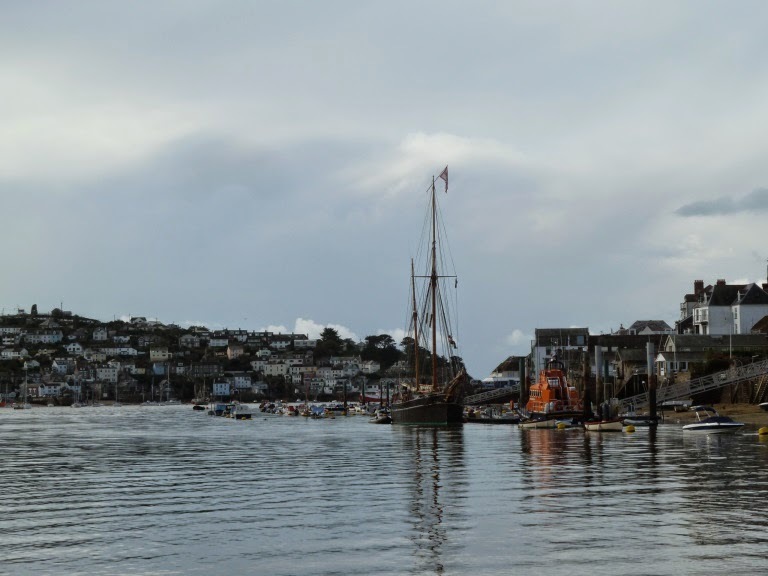 Down among the moorings in Falmouth and going all the way up to Penryn there are normally some interesting day boats. The challenge is getting a clear view from quay. Above the small raised coach roof is an interesting feature, presumably it provides some dry and secure storage or maybe even a couple of berths and somewhere to cook. 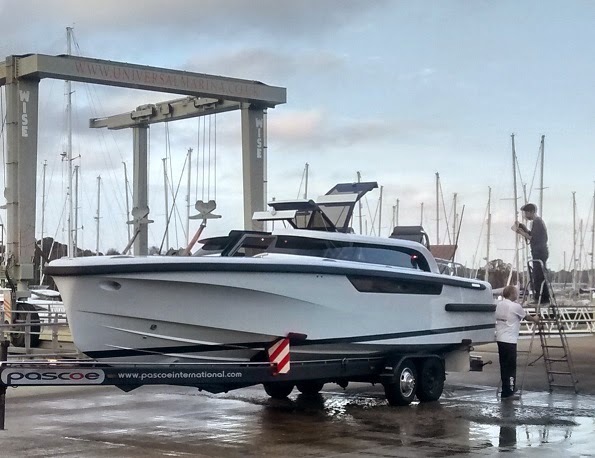 The profile certainly compliments the overall look of the boat. 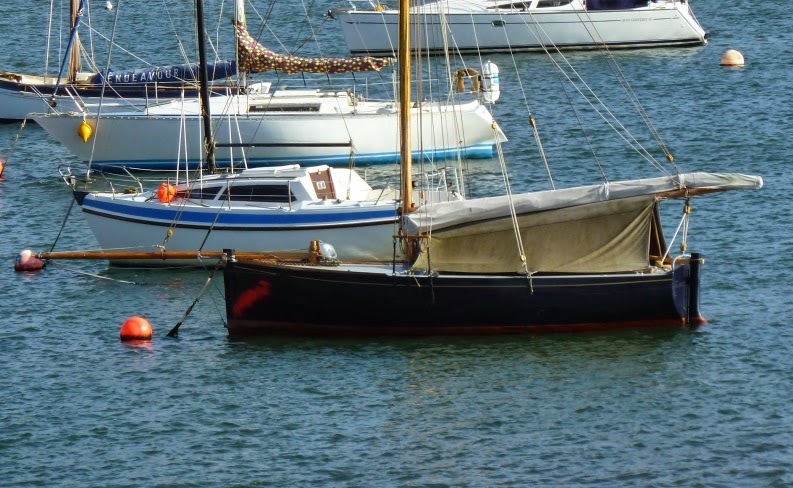 A classic west country boat, well to my mind at least, I really like the colour scheme, the grey and white really sets off the varnished coaming and that sheer rising up to the bowsprit. This was my favorite by a long margin. 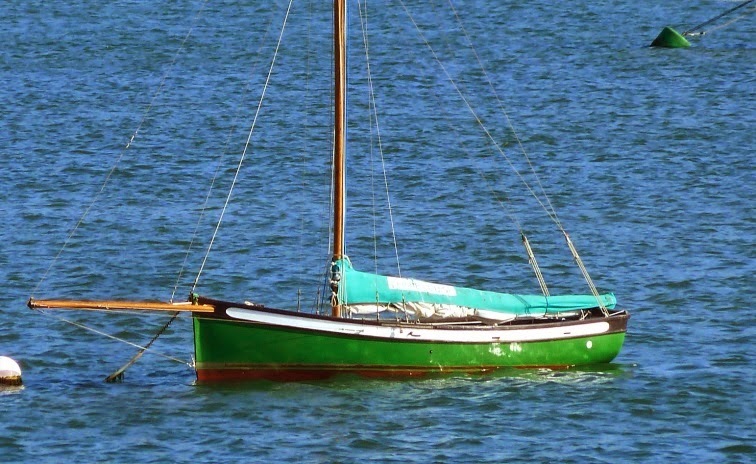 A beautiful pea green boat, as the poem goes, looking well cared for and ready to go. 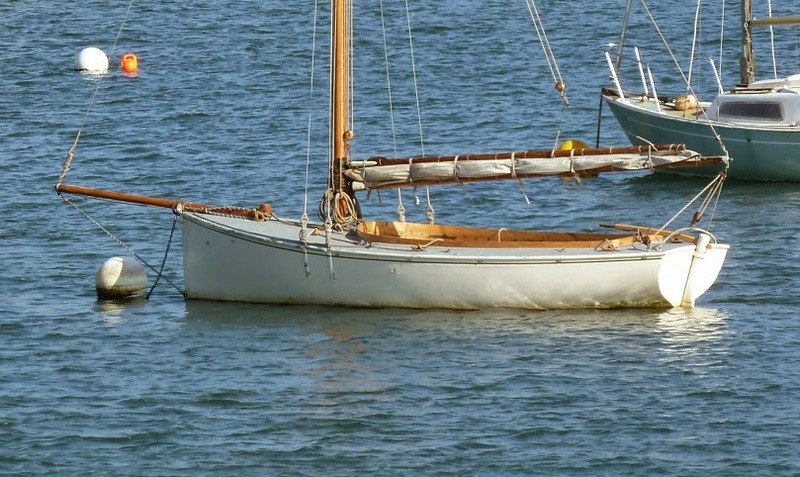 Guessing that she's either an open mayfly Oysetercatcher 16 or one of the Heard boats built at nearby Mylor. 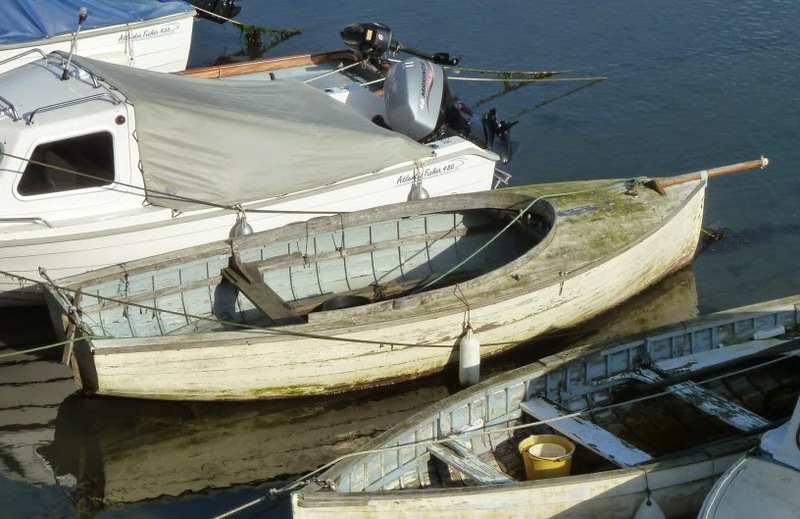 Plumb stem and transom, this has the look of a working boat, intuitively it seems too small for a quay punt. 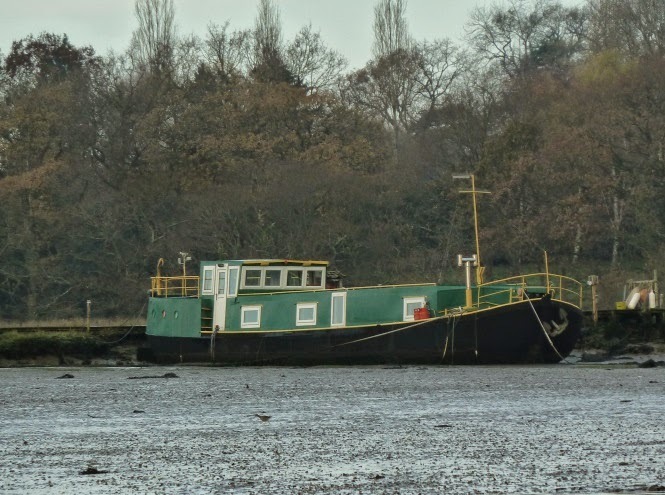 I've written about this one before sadly in need of some tlc and attention, but a fine looking boat. On the day the bilges were dry and clean and there was evidence that someone had been down recently to clear out the rainwater and scrub the bottom boards. Lets hope they have plans to restore her. It was only just over a month ago that I took this picture, since then the clocks have gone back, its dark going out in the mornings, it's dark coming home at night and the weekends seem to be grey and drizzly. Maybe it just seems that way or perhaps I'm suffering from sunlight deficiency syndrome. Captain Horatio Pugwash and his crew; Master Mate, Pirates Barnabas, Willy and Tom the Cabin Boy may have given up their television career in 1967, but their notoriety continues, not least due to some dubious and totally false urban myths which originated in the 1990's claiming sexual connotations based on a risque distortion of the character's names. 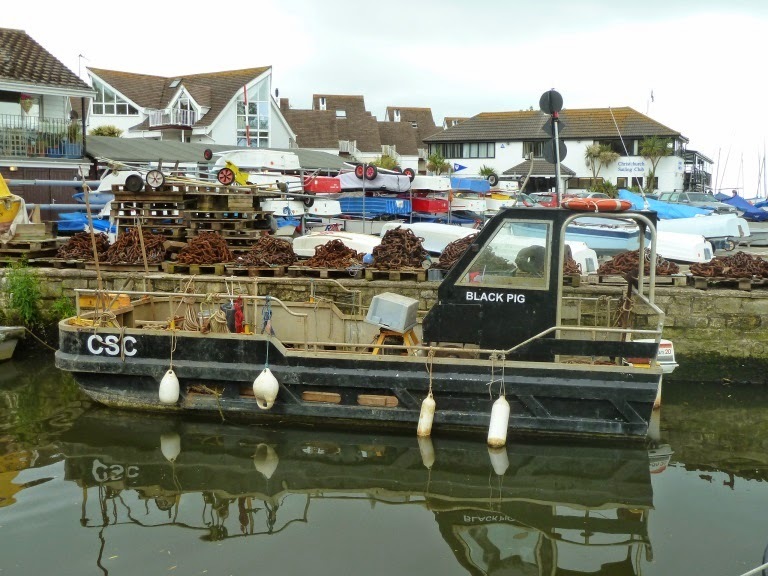 Of course the truth is that the good captain and crew retired to run a dredging operation in Christchurch harbour. I wonder what happened to the Captain's mortal enemy Cut Throat Jake? While we didn't get the spectacular low sun and colours of the previous weekend, the moody, changing sky brought a little breeze which meant the racers had a better time of things. On Sunday the sea was flat and grey/green with around 5 to 8 knots of wind, a little light but the fleet was moving along pretty well. 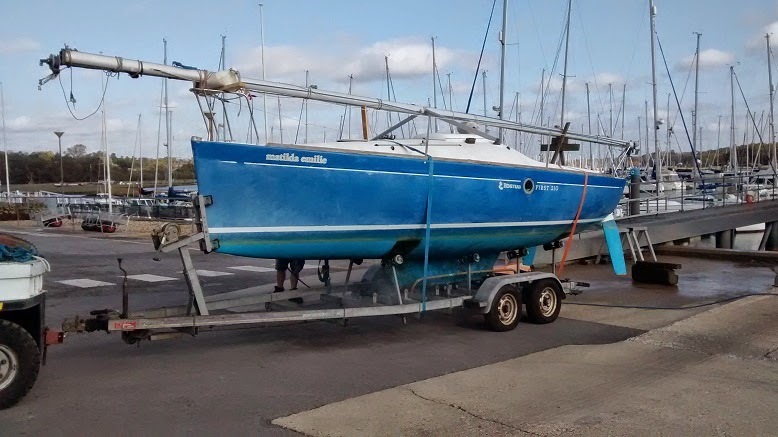 With Matilda Emilie sold and Tosh up on blocks while I do some well overdue maintenance and repair to her trailer I'm starting to get withdrawal symptoms, I clearly need to get out on the water. 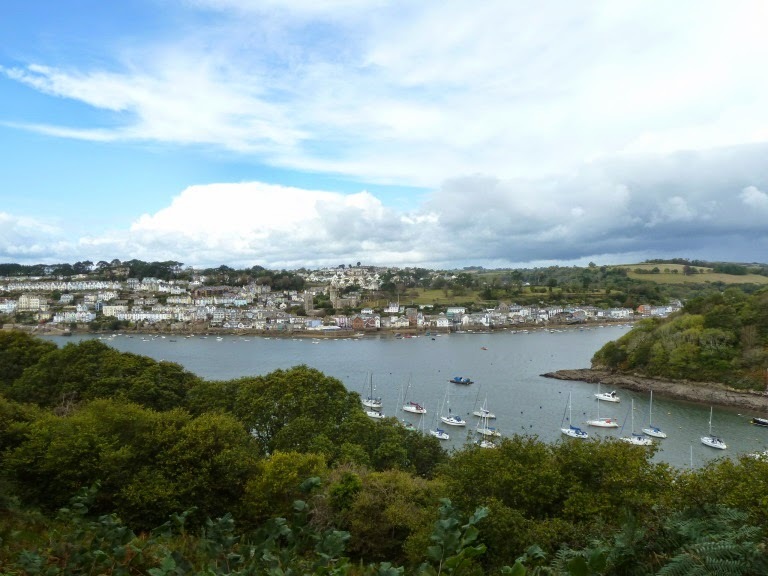 We're fortunate having visited Fowey so many times we have explored most of the local paths and byways but this is our favorite. Starting in the town we caught the Bodinnick ferry across the river to start our walk. 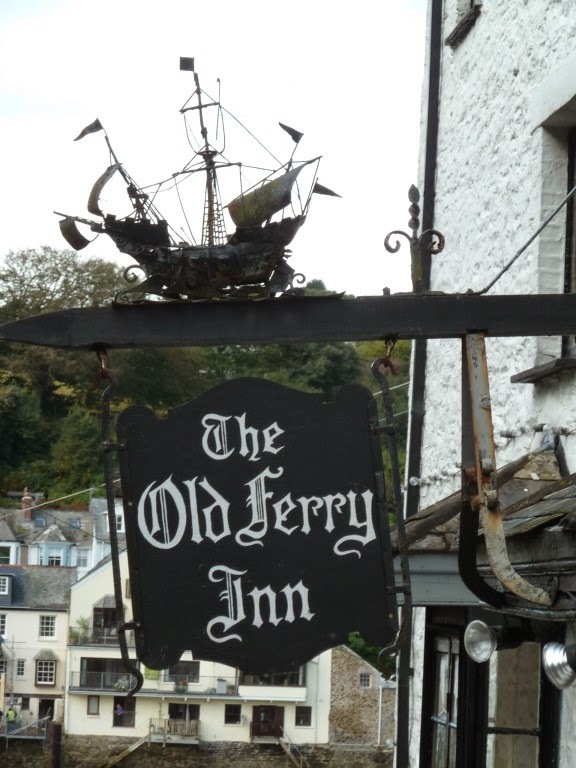 The walk can be done the other way around in which case the Old Ferry Inn makes a nice stop at the end of the walk especially if you time things to arrive for lunch. From Bodinnick you rise quickly and follow the foot path and National Trust signs which explain that the path was donated by a local land owner. There is a memorial to the towns people who fought and died in the two world wars with a view back across the river. 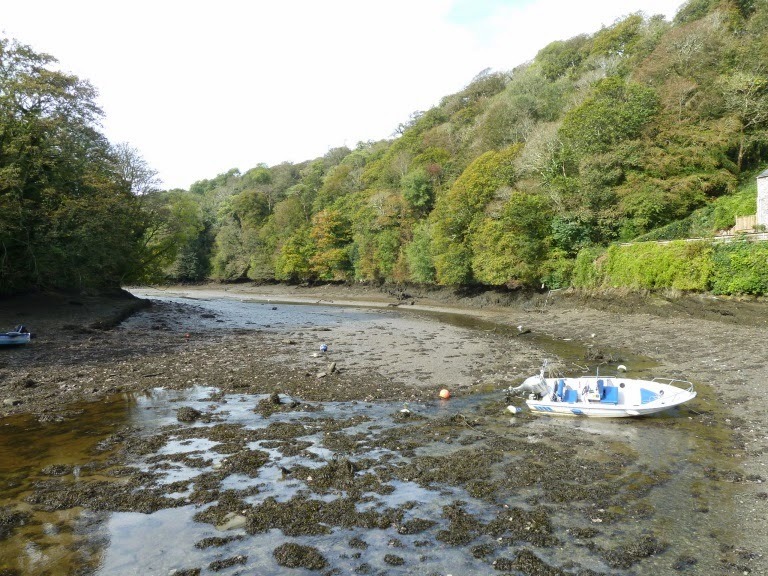 Following the path you reach the head of Pont Pill the creek which leads east from Fowey. 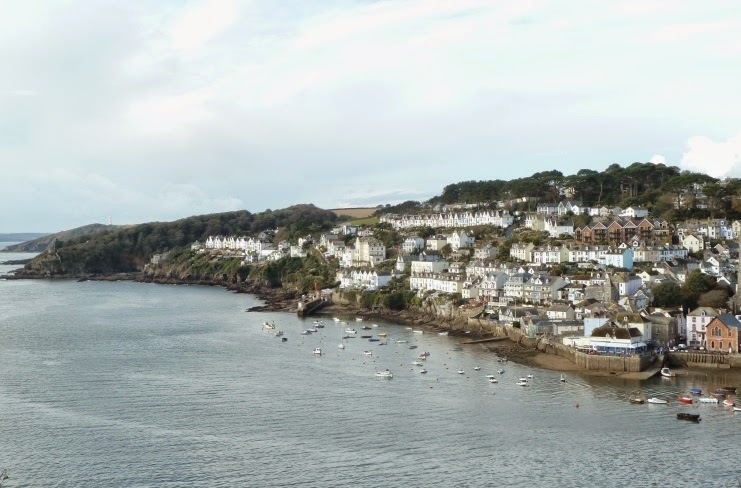 It's a fantastic viewpoint looking south toward Polruan, Gribbon Head (the day mark tower can be seen on the headland on the right) and away across St Austell bay. The path dips and rises but stays more or less on the top all the way to the top of the creek. I get confused and can never remember if it's Pill Creek or Pont Creek, the name Pont Pill seems to refer to the bridge (Pont) at the top of the creek. Below moorings at the river end of the creek, further up it dries so there are only a few boats which can take the ground. Low water at the top of the creek, the path descends quickly down to Pont Pill, there is an old dock, a couple of houses and the remains of lime kilns. Very quiet and a good place to stop for a break. 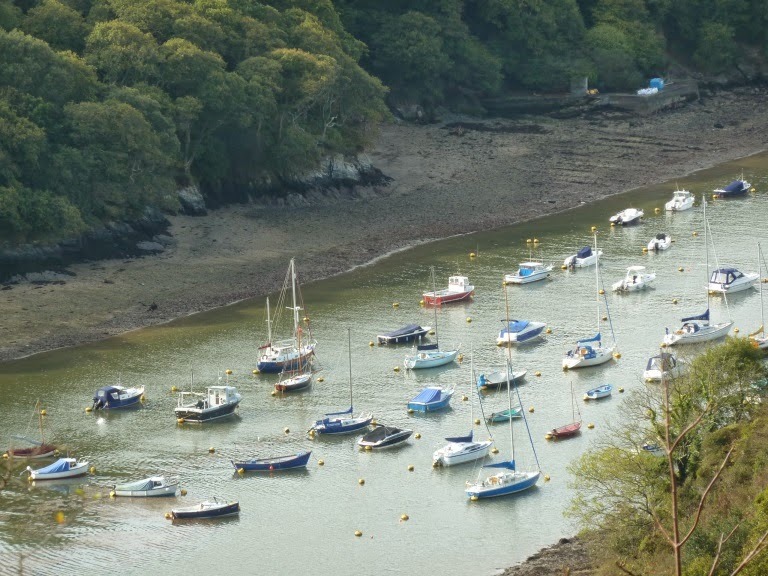 Leaving Pont Pill the path rises quickly again and you're soon walking along the top with views along the creek and across the river to Fowey. 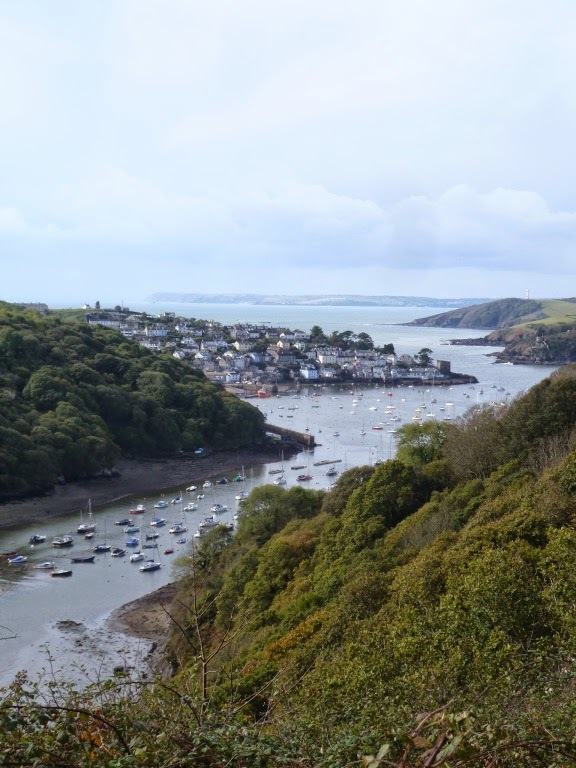 There has been a land slip recently so the path was diverted but the end of the walk is the same, Polruan the smaller village on the opposite shore to Fowey. 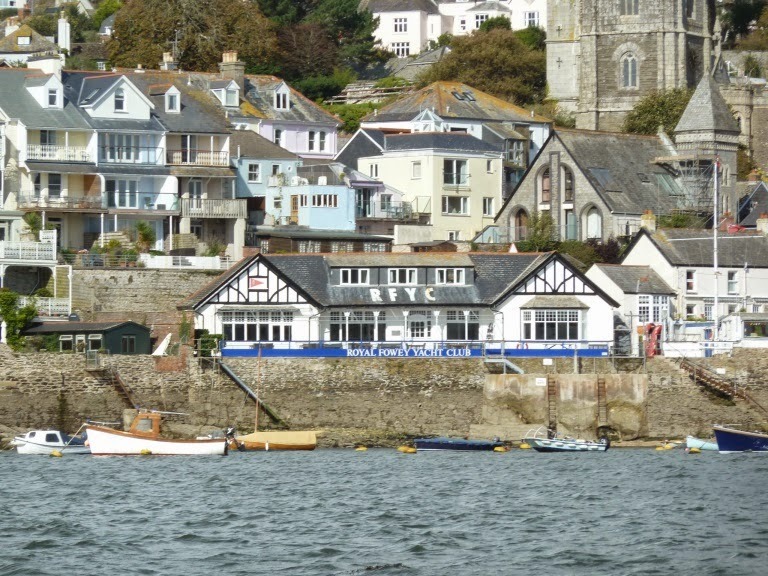 There are a couple of cafes and the Lugger pub which used to have a reputation for great fish and chips, I haven't been for a few years hopefully things are still the same. 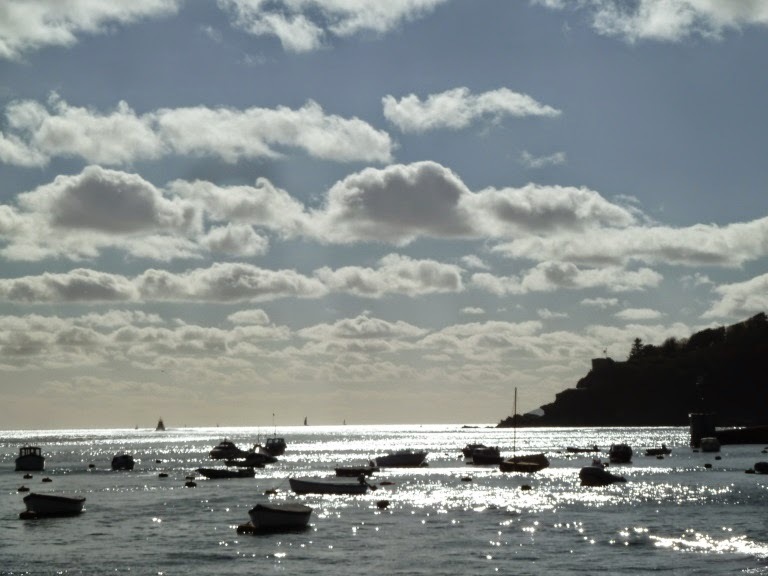 If you're still feeling energetic Polruam is worth exploring, go down to the castle and up to the old coast guard watch station. 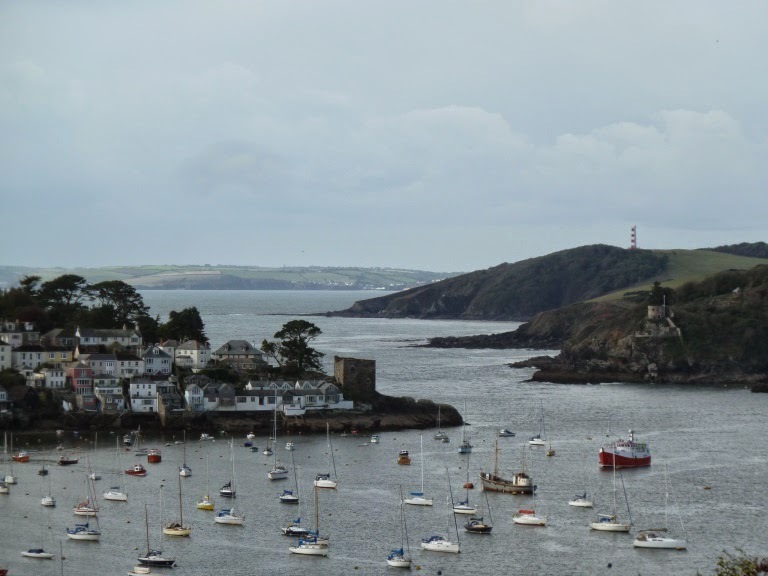 When you're ready go down to the quay and catch the ferry back to Fowey and take the opportunity to get a waterside view of some of the interesting buildings in the town. Map My walk clocked the distance at 8km which included the ferry rides. If you're down in Cornwall I hope you find this useful. For those a little further away hopefully you enjoyed the views.